The Tekton 2841 Everybit 135-piece electronic repair kit and security bit set is down to $28.51 on Amazon. This set normally sells between $33 and $34, and it has never dropped below $29 before. Tekton also has a 27-piece kit on sale for $8.41. It normally sells for around $10, and this is its lowest price ever. 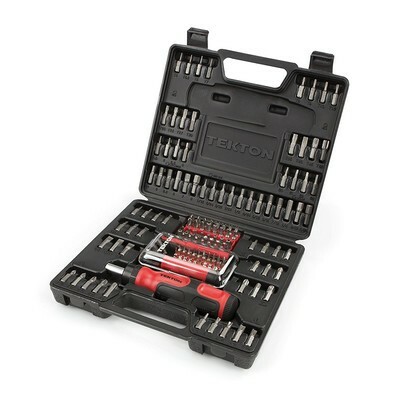 Check out the dozen other kits and tools on sale from Tekton right now. The 2841 Everybit kit has 105 screwdriver bits, 22 precision bits, and a ratcheting screwdriver. The screwdriver has multiple drive positions and a rubber grip for comfort. The bits are designed with repairing electronics in mind, including laptops, tablets, phones, gaming consoles, watches, and more. It even includes pentalobe bits specifically for the iPhone and MacBook. Users give it 4.6 stars based on 888 reviews.